A sense of green urgency at Park City’s Powdr Corp. The snowguns blasting at the base of Park City Mountain Resort are a mix of new, efficient guns and older ones. The resort recently replaced 67 guns as part of a gradual effort to upgrade all of its snowmaking equipment. 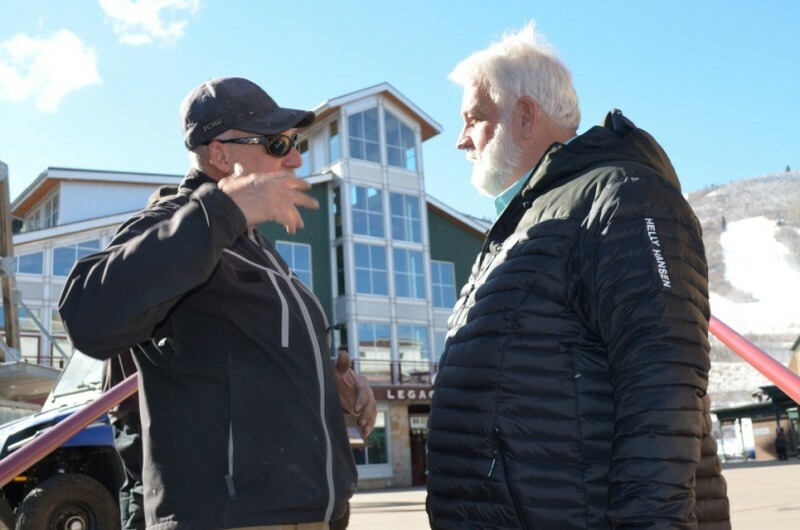 Mike Testa, left, a building maintenance worker, alerts Park City Mountain Resort Chief Sustainability Officer Brent Giles to an unnecessary waste of power at the resort’s Legacy Lodge. PARK CITY, Utah — We were descending the stairs to leave Park City Mountain Resort’s main base-area plaza when a guy pulled up swiftly in an electric golf cart and stopped Brent Giles, the company’s chief sustainability officer. The man in the cart was Mike Testa, of the resort’s building-maintenance crew, and he wanted Giles to know that someone was leaving a dishwasher motor running all night long in the Legacy Lodge. Testa was concerned about the wasted energy, and he knew that Giles, whose job is energy efficiency and conservation, could set the matter straight. Giles listened carefully, thanked Testa for the information and then asked Testa to send him an email reminder. One, sustainability and energy efficiency depend, to a great degree, on human behavior — turning off lights, turning down thermostats and changing habits. When people forget or decide not to try, then a sustainability officer picks up the slack. Sustainability officers are organizational energy cops, and just like law-and-order cops, they need tips to track down violations. In this case, Testa was Giles’ tipster. Two, tips like Testa’s are indicators of a conservation-oriented culture. During the height of winter, Powdr Corp, which owns the Park City ski area and eight other resorts, employs roughly 1,500 people at Park City alone. The only way an organization of that size can track and reduce energy consumption is to foster a culture where everyone takes ownership of a shared goal. Such a culture encourages electricians, mechanics, snowcat drivers and building-maintenance guys to sound alarms about unnecessary waste. 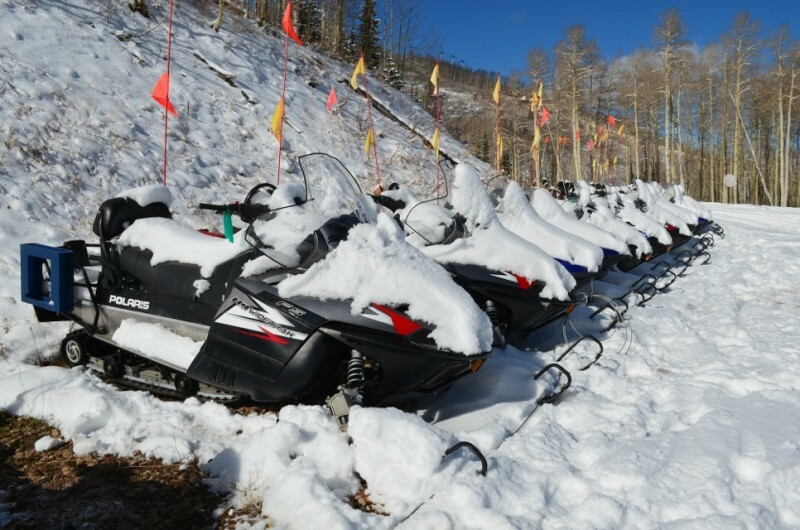 Park City has reduced its snowmobile fleet by 30 percent, and half of the remaining vehicles are four-stroke, rather than two-stroke, engines. This reduces pollutants, including greenhouse gases. Powdr’s culture of environmental stewardship has helped the company reduce its carbon footprint by nearly 60 percent in roughly seven years. In 2008, the company began purchasing enough renewable-wind-energy credits to offset its annual electricity usage. That practice continues alongside specific energy-efficiency projects at Park City and other Powdr resorts, including Copper Mountain in Colorado, Vermont’s Killington, Mt. Bachelor in Oregon and Boreal Mountain near Lake Tahoe, Calif.
Powdr has invested $6 million overall in energy and sustainability initiatives, including a joint venture to power a Killington gondola using methane gas from cow manure. “We’re privately held, and the owners of Powdr believe this is a moral issue, so they set aside a portion of revenues annually for these initiatives,” Giles said. He has noticed some of Aspen Skiing Co.’s energy- and climate-related efforts. 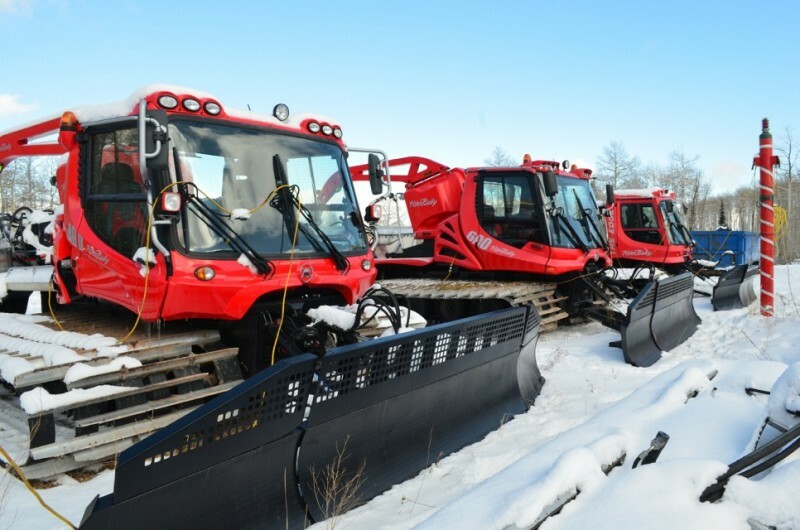 Powdr’s initiatives run the ski-area gamut, from efficient snowmaking to LED lighting retrofits to four-stroke snowmobiles and biofuel-powered snowcats. Based in Park City, Powdr runs ski resorts exclusively and has not expanded into real estate development and associated businesses. “I’d definitely say Park City Mountain Resort has been one of Utah’s leading ski resorts on overall sustainability and putting their money where their mouth is as far as energy and efficiency,” said Sara Baldwin Auck, senior policy and regulatory associate at the nonprofit Utah Clean Energy. She gives Powdr credit for both cleaning up its own house and advocating for broader environmental action at the state and federal levels. However, she wishes she saw more advocacy from the ski industry in general. Aspen resembles Park City in many respects, a mining town reinvented as a tourism destination, with ski slopes that descend directly into the city. Aspen, however, has a skiing company, a city government and even a business community in close alignment on climate issues. Furthermore, the state of Colorado has established renewable-energy standards for all electric utilities with an eye toward building a clean-energy economy. In Park City and Utah generally, the clean-energy movement is more nascent, and Utah’s conservative Legislature prefers voluntary green programs to potentially burdensome mandates. Nonetheless, the state is making strides, and businesses like Powdr are showing the way. The town of Park City is a blotch of political blue in a reliably red state known widely as the home of the Mormon church. When it comes to energy consumption, Park City environmental project manager Matt Abbott says city residents are generally green-minded but haven’t yet done the hard work to reduce per-capita consumption. “Like a lot of ski towns, we’re kind of fat and happy up here,” he said. In a recent “Ski Town Showdown,” Park City beat Aspen in a contest among city employees to use less energy and water, recycle more materials and generally live clean and green. Still, Abbott says, 60 percent of Park City workers live outside the city, and no regional transit system exists to efficiently carry them to work. As a whole, Park City residents consume electricity and natural gas at roughly twice the rate of average Americans, Abbott said. Earlier this year, the Summit Community Solar program persuaded 59 homeowners from Park City and neighboring towns to install solar panels in their homes and yards, and it ended up creating 327 kilowatts of power generation. By purchasing panels in bulk and arranging for lower permit fees, the program provided an easy way for residents to go green. The Park City government also is investing where it can to reduce its own power consumption by retrofitting municipal buildings and installing rooftop solar panels. The city’s Water Department also aims to lower its own energy use by generating hydroelectric power. 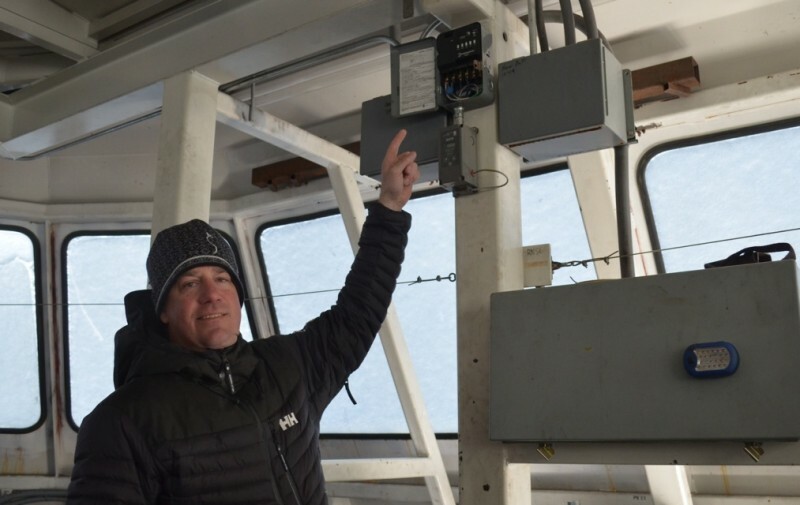 This timer, indicated by Mountain Operations Director Brian Suhadolc, reduces the energy that Park City Mountain Resort uses to heat its lift terminals. Of all the electricity generated in Utah, 76 percent comes from coal-fired plants. Three percent comes from renewable sources such as solar and wind, and the remainder is natural gas. The state Legislature has set a goal of having 20 percent renewable energy by 2025, but Baldwin Auck says the initiative is voluntary and hasn’t had much impact. On the other hand, a “net metering” law that allows property owners to install renewables and sell their home-generated power back to their utility has been a huge success. It could be argued that, when it comes to energy conservation and efficiency, the general public is ahead of the institutional players in Utah. The state’s largest electric utility, Rocky Mountain Power, says it generates the bulk of its power — 60 percent — from coal, but renewables presently represent 16 to 17 percent of its portfolio, and it offers attractive incentives for homeowners and businesses to make energy-saving upgrades. Park City Mountain Resort has used those incentives to lower its costs on multiple occasions. Meanwhile, the state government is moving to enable green-power development. Passed in 2012, Senate Bill 12, also known as the eBay bill, allows companies (chiefly large energy users) to buy clean power from energy developers or generate and transmit clean power themselves. EBay, which lobbied for the bill along with other high-tech players, used the legislation to erect a major solar-generation facility to supply its data center in South Jordan, Utah. 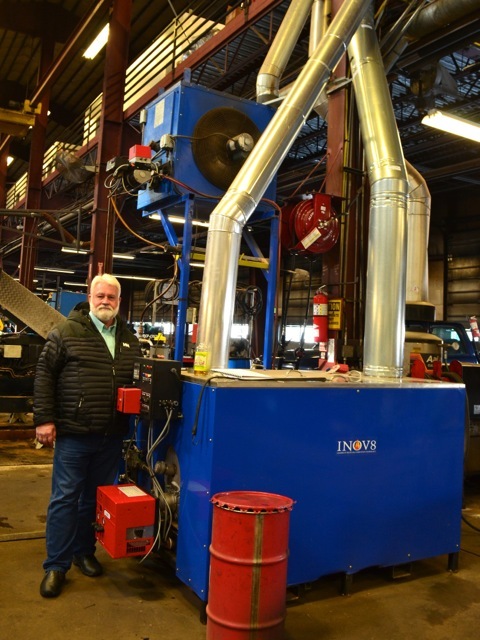 Chief Sustainability Officer Brent Giles says Park City Mountain Resort generates 1500-1700 gallons of waste oil annually and uses it to heat the maintenance shop with this furnace. The company sees this as a fairly urgent matter. So, irrespective of Utah’s culture and politics, Powdr continues to chip away at the problem. Park City Mountain Resort recently installed 146 solar panels on two of its base-area buildings, which is enough energy generation to supply as many as four average U.S. homes. It’s not a huge amount of energy, but Giles says the panels’ educational value made them worthwhile. “You have to call attention to this stuff,” he said. Ongoing changes to Park City’s snowmaking systems — which represent roughly half of the resort’s power consumption — will have a bigger impact on both finances and carbon emissions. In the past five years, snow guns have run for an average of 1,200 hours per season, more time than the chairlifts (although concentrated at the front end of the season). 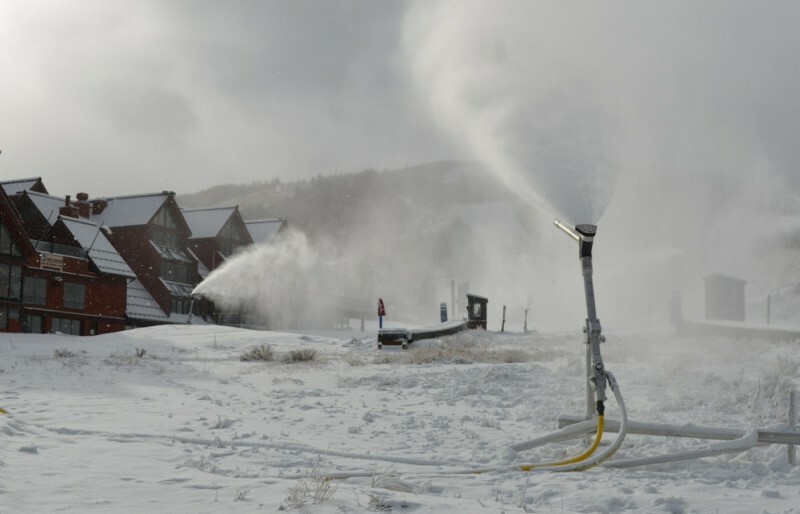 The 3,300-acre resort can now make snow on roughly 350 acres. This puts Park City, along with other resorts, in the position of having to make more artificial snow even though the energy-consumptive practice contributes to climate change. Fortunately, air compressors and snow guns have become much more efficient in recent years. Park City recently spent $220,000 to install new tower guns at its Neff Land (sponsored by Neff, the headwear and clothing maker) terrain park, and the system ended up being 95 percent more efficient. “We expect to save over $40,000 annually on electricity because of efficiency just on this project,” Giles said. If that prediction proves true, then the project will pay for itself in four to five years. That’s good news environmentally and economically, but the fact remains that nobody knows exactly how climate change will play out on the slopes. Editor’s note: This is the third in a series of stories produced by Aspen Journalism in collaboration with The Aspen Times about the energy-efficiency and sustainability efforts of various ski areas. The first looked at Aspen Skiing Co.’s coal-mine methane project, the second at Vail Resorts’ energy efficiency measures. Also note, that on Dec. 30, 2013, this story was updated to better reflect the amount of renewable energy in Rocky Mountain Power’s portfolio. Aspenites might be interested to know that Park City Mountain Resort has a no idling policy regarding its snowcats. This helps reduce fuel consumption and emissions, alongside the resort's use of biodiesel fuel. loved the standard information a person provide for your guests? Not to mention, it’s going to involve a great deal of cash.